Getting back into the routine of daily learning was hard for some of the “Can Dos” after the holiday vacation. So Miss Pat challenged the class to a story contest to get the “Can Dos back to thinking, being creative and writing. Miss Pat asked the class to use the 5 Ws and the 1H of writing that they learned about before the holiday break to write a story about a puppy being bathed in a sink. Well, to Miss Pat’s surprise, the best story, called, “A Bath for Scooter,” was written by Arthur Jay. After Miss Pat announced the winner of the story contest about the puppy in the sink, she asked Arthur J to read his story to the class. Arthur J stood up, cleared his throat and started reading. 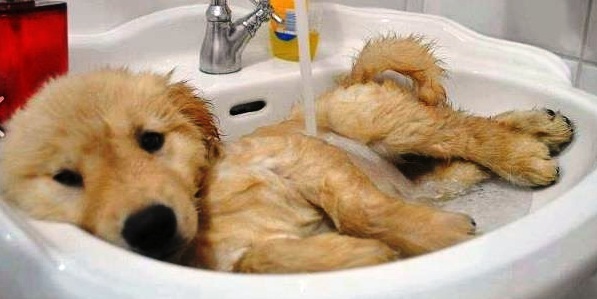 A Bath for Scooter, by Arthur J.
Scooter is a puppy that gets into things. Yesterday Scooter got into the kitchen trash can and got covered with sticky stuff. Bobby’s mom told Bobby to give Scooter a bath in the sink. Bobby wasn’t happy about having to give Scooter a bath. His mom reminded him of how he kept asking for a puppy and how he promised to take care of the puppy if she would just get him one. Bobby got the puppy soap. He picked up Scooter and put him in the sink. Scooter tried to get out of the sink, but he couldn’t. So he just laid his head on the side of the sink and got a sad look on his face. Bobby washed Scooter and dried him with a towel that was just for him. He rubbed him all over until his fur was all fluffy. Then Scooter ran all around. Scooter looked and smelled good. Whiles Scooter was running around, Bobby cleaned the bathroom and threw the towel in the wash. As he was cleaning up, Bobby made up his mind to do a better job of watching Scooter. He didn’t want to have to keep giving Scooter a bath and he didn’t want his mom to be mad a Scooter. Okay, boys and girls at home why don’t you write a story about the puppy in the picture? In our next post, we will talk about the 5Ws and the 1H questions. Why not print out Arthur J’s story then circle the who, what, where, when and why and the how answers in Arthur J’s story. Let’s see how you do when you compare your answers to the ones the “Can Dos” give Miss Pat. Story hour was just about to begin. Miss Hattie, known to some of the “Can Do” Kids as Grandma Hattie, was just settling down in her comfortable chair at the front of the room. She had a storybook in her hand when the door opened and there was Jay! The “Can Dos” settled down and paid close attention as Jay told his story. “Once there were so many buffalo on the Great Plains. The buffalo were revered by my people both in songs and stories. The buffalo provided food and clothing and other things that my tribe needed in order to live. My people followed the buffalo as they moved around looking for food to eat. My tribe would pack up all that they owned and make camp near where the buffalo were grazing. The men would go out and hunt buffalo while the women and children stayed behind. When the men brought the buffalo they killed back to the camp, the women and children would help to make the things they needed to survive. My tribe did not waste any part of the buffalo. With that, Jay unrolled the picture below. The “Can Dos” were amazed to see all the ways that Jay’s tribe had used the buffalo to survive. Be sure to click on the picture to make it larger and see all the things Jay’s tribe made from the buffalo!